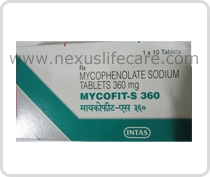 Used :- Mycofit-S Tablets mycophenolate is an immunosuppressant drug used to prevent rejection in organ transplantation. It was initially marketed as the prodrug mycophenolate mofetil (MMF) to improve oral bioavailability. More recently, the salt mycophenolate sodium has also been introduced.Mycofit-S Tablets is commonly marketed under the trade names CellCept (mycophenolate mofetil; Roche) and Myfortic (mycophenolate sodium; Novartis).